The perfect portable inverter generator, both for back up power and for RVs/Camping/Tailgating. The Honda EU2200i, an upgrade on the hugely popular EU2000i, is a popular portable inverter generator which is conveniently quiet, remarkably lightweight and moveable, and is impressively powerful while remaining fuel-efficient. It comes rigged up with a feature called the Eco Throttle ™, which enables optimal fuel efficiency and engine speed. It works to regulate the engine so that it only runs as fast as needed. The Eco Throttle™ enabled machine will run for over 8 hours on the 1.1 gallon fuel supply. The generator runs on 12-volt DC batteries, and you can buy a charging cord to go along with the machine. If one is not quite enough, the purchase of a parallel cable gives you the possibility of 3200 Watts by running this generator in sync with its companion kit. But with proper care and maintenance this piece of equipment offers you a guaranteed 5000 hours (208 complete days) of highly fuel-efficient work. Having a portable electric generator can be the ideal choice for those who suffer from loss of electricity or those who have no electricity at all. 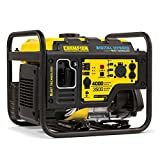 Portable generators are by no means a form of a regular power supply, in fact they are merely used as an emergency backup when the power goes out, and, since these are portable, they can be used for being an extremely convenient form of power and can be used for occasional purposes or recreational purposes as well. These portable generators have become quite common now and are available readily, in different styles, sizes and models. One such generator from the portable category is the Honda EU2000i generator, which is an inverter generator and is one of the most useful generators in the market. Honda is a well-known brand name which is recognized as high quality all over the world. They are one of the key manufacturers of power equipment and especially generators, which are available in three categories, that are low cost, powerful, and the best and the safest ones to be used for electronic equipment. Honda has been in business for more than five decades now and their first portable generator came out in the market in 1965. Therefore, they are one of the pioneers in portable generators and their products are manufactured with great quality standards and are made to last. With their constant research and developments, their portable generators are changing with the needs of the time in order to provide the customers with the latest technology, fuel efficiency at affordable prices. Who is this Honda EU2200I Portable Generator for? Since this is a portable inverter generator, it is like carrying a duffel bag that is about 40 pounds in weight. It is covered in an insulated housing which keeps the level of noise down. While most of the generators that are job site generators end up providing uneven electricity due to the sags and surges in the power supply, the inverter generator provides electricity that is steady. This makes it the ideal choice for home use, especially for running your electronic devices on it, like your DVD players, refrigerators or television, etc. It can be used for your camping trip as well or can be used in a trailer or for fishing or hunting trips if you are working remotely along with your power tools somewhere. This generator can also be useful when you have limited power or when you need power during some emergency. On the other hand, if you require power to run your whole house then this is not the right machine for you, since this is like a backup generator, or a portable one that can be carried with you. To run power for a whole house, you would require a standby generator that is not only stationary but also large that is installed by an expert electrician and has wires that go into your breaker box. This portable EU2000I generator by Honda is extremely quiet and quite light in weight, which means it can be moved very easily. Along with this we found this generator to be quite fuel efficient also, even though it is very powerful in running all the electronic devices effectively. This generator is equipped with a unique technology that is patented by Honda and is known as the Eco Throttle, through which it can have optimal efficiency in fuel usage as well as for the speed of the engine. It works quite effectively to regulate how the engine works so that it can run just as fast as needed or that is required. With the eco throttle technology, the generator can run easily for more than eight hours at just 1.1 gallon of fuel supply. Moreover, the generator has 12 volt batteries but you have to buy the charging cord yourself to use it with the machine. If one charging cord is not good enough, then you may purchase a parallel cable through which you may have the option of 3,200 watts by making the generator run along with the kit. Furthermore, along with proper maintenance as well as with proper care, this generator can guarantee you 5,000 hours. That is about 28 whole days of usage that is extremely fuel efficient and powerful at the same time! The generator is portable and lightweight, thus making it easy to move it around. It has a quiet operation that keeps the level of noise down as compared to traditional generators. It is equipped with Honda reliability and brand name. Honda is known to have a friendly and communicative after sales services. It is available in a sleek and compact red design. One of the main features that make this Honda EU2200i generator stand apart from the rest of the traditional generators is that it has an inverter technology that has some great features and functions. How does Inverter generator work? The inverter technology by Honda works in such a way that it takes the raw power from the generator and then uses a special microprocessor to work it through a step by step process. The microprocessor is able to control the entire process of producing and providing the power as well as controlling the engine speed as well. Since this generator uses Honda’s inverter technology, which is one of the best and the most popular, the user can be assured it is of the highest quality and that is able to produce consistent and stable power supply. This means that it is able to run and provide power to even the most sensitive electronic equipments. This inverter generator technology by Honda is quite precise and aims to provide a power that is close to line power. The whole idea of inverter generator is to provide a steady power similar to the power that is provided by the electricity suppliers. This inverter technology from Honda, through their engineers, is able to integrate parts from the generator and the engine. This allows the inverter generators to be smaller and light in size and in weight, making them movable and easy to use. This Honda inverter generator is equipped with the Eco throttle technology, which means it can allow the generator’s engine to adjust the speed of the engine automatically in order to produce only the power that is needed for usage. Most of the conventional generators run at around 3,600 RPM and they are able to produce about 60 hertz (cycle) or power or electricity. Those generators which have the eco throttle technology though are able to run at a slower RPM while at the same time, they are able to maintain their power and their frequency for the load that is being requested. This way, since the engine is not running at its full speed constantly, this eco throttle technology then is able to reduce the consumption of the fuel by over 40%. Through this, it is also able to reduce the exhaust emissions as well. As such, making this generator a high fuel efficient and a eco friendly machine which can save costs in terms of fuel as well as be environmental friendly. This inverter generator by Honda is equipped with the ability to run very quietly as compared to the other traditional models. Having the eco throttle technology, it is able to reduce the noise levels and since the engine does not run at its full speed all the time, as such the generator is not very noisy. Moreover, it is also equipped with a special sound dampening material and also because the engines which are made by Honda are generally quieter than other brands. 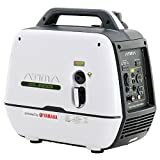 This generator is quite lightweight, as already mentioned and equipped with a contoured handle on top, makes it easy to carry it and comfortable as well. There is a plastic shroud that covers it, which makes it look sleek and makes the transport easy. Starting up the generator is quite simple and the unit is equipped with just a gentle pull for startup. For reviewing, we pulled on the eco throttle and the generated just hummed along. The noise level was great and it is able to easily pick on the load of the fridge and other electronic devices, mostly with low wattage. The gas tank of the generator can be used from the top of the unit and the refuelling process is also quite easy and safe to do so, even during the time when the unit is running. There is a reservoir on the top, around the opening so that if the fuel does not go completely inside the tank, it will not run down the unit. This makes it quite safe to use. There is however, no indicator for fuel, which means that there is no way of knowing when the generator is out of gas. This Honda EU2200I 2200 Watt Portable Generator with Inverter was selling for about $1,000 when we conducted this review. 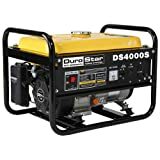 This price range makes it one of the most high end generators and when compared to other similar brands and generators, it is quite a value for money. It may be over the budget for a few people, as such there are other varieties of portable generators that are available at a much cheaper price but of course with lesser options and features. The price for this should be given around 2/5. When it comes to Honda, almost everyone has heard of it. They do not just make cars, but have a large variety of other power equipment which they have been manufacturing for the past so many years. Honda has always been known for their great quality, for being a reliable and trustworthy brand, and of course for their powerful machineries and equipment. 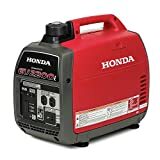 This Honda EU2200I 2200 Watt Portable Generator with Inverter is equipped with a very powerful engine that is made by Honda and as such the brand name in this case should be given a 5/5 for being a reliable one. According to the specifications of this generator, it is rated at about 2200W peak power and it has a rated output of about 1800W. This means that there is always 1800W capability available in order to handle any spikes that can go up to 2200W. It is equipped with a large Honda engine which weighs only about 45 pounds and yet it is quite a powerful machine. When it comes to portable inverter generators, they are usually very small, compact and not very powerful. However, this Honda EU2200I 2200 Watt Portable Generator with Inverter was a pleasant surprise to us. We found the unit power of this small and compact generator at 2200W to be quite efficient for a generator that is not just an inverter generator but also a portable one. For its size and its features, being so powerful deserves a 4/5 ranking. 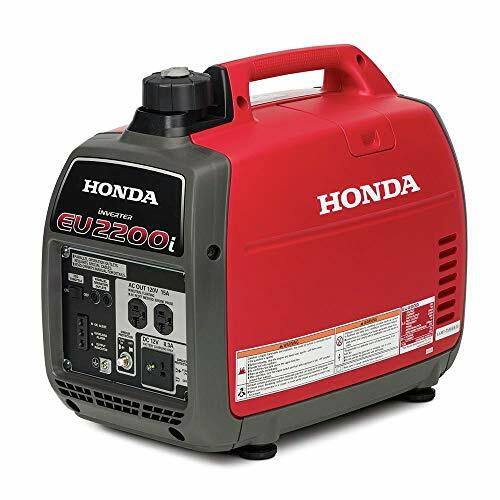 As mentioned already, one thing we liked about this generator was that we found it quite fuel efficient as this Honda EU2200I 2200 Watt Portable Generator with Inverter can easily run for more than eight hours in just 1 gallon of gas. This makes it an ideal choice for those who are either environmental friendly and want to conserve energy. It is also quite useful for those who live in areas where gas is expensive or not readily available. This is also the ideal choice to be used for commercial operations which are small in nature and it can provide uninterrupted power to your domestic appliances for hours during emergencies. It has a high rated load which can take about 2200 watts and it can also operate on its maximum capacity for about four hours. It can easily work for eight hours straight when it is taking the load of about 25%. This makes it versatile as well as flexible with having two AC outlets and a single DC outlet. It is enough to keep your daily functions going on as well as keep your light on, along with providing a stable power supply for internet and other things before the proper power resumes. The running time of this generator is limited to the fuel tank capacity and this can be solved by attaching an external fuel tank. All this means that, with such a great running time, this feature deserves a 5/5 for being fuel efficient as well!
. You have to make sure you rinse thoroughly. You have to place the filters in the oil before putting them back in the generator and this can be done by putting it in a zip lock bag where you can simply pour in some oil and drop the filters then seal and squeeze the bag to make sure the oil is spread all over the filters. With proper care, maintenance and cleaning, your generator can work and perform better and will last longer! What is the use of a portable device when it cannot be moved around? Various equipmentswhich are known to be “portable” are so heavy that moving it may require 2-3 people at one time. This usually kills the purpose of the device being portable in the first place since it is not causing any convenience to you. With this in mind, we reviewed this Honda EU2200I 2200 Watt Portable Generator with Inverter and found it to our surprise, as an extremely lightweight and movable piece of equipment! It weighs just 50 pounds which is very less for a powerful generator and we found it easy to move as well. This EU2200I generator by Honda is the ideal companion to take with you for your camping trips where you want to keep low levels of noise and maintain some peace and tranquility in the outdoors. It is also able to provide uninterrupted and stable power for all of the electronic gadgets which includes the television, fridges, computers, tablets, DVD players and many more. In terms of portability, it comes as a reliable, easy to use and cost effective answer for having additional back up of power wherever and whenever it is required. For having such a relevant and useful feature, this deserves a 5/5. Having a portable electronic generator at home is surely an essential tool. It can really be a life saver if you suddenly lose your power. The Honda EU2200i is the ideal choice for you if you are looking for a portable and inverter generator. It is not just a perfect little size, but is also lightweight, even though it is really powerful and runs most of electronic devices efficiently. Moreover, it does not require too much fuel, which makes it cheaper in the long run as well. In the light of all this, we found this generator truly as great equipment and at $1,000 it is a high end generator that is bound to last for years and years. This generator is able to provide you a handy backup power which should be at home all the time or when you are travelling. It is equipped with all of the key features that are needed in a reliable and a high output generator. The best features we liked about this generator were its efficient fuel usage, its compact and ergonomic design that makes it very easy to move to around. We also liked its functionality and its performance, we found it user friendly and the whole process of start up to carrying it with you makes it a simple device, being a simple machine, even though it is quite powerful. Moreover, with a brand name of Honda, there is a level of trust and reliability with buying from well known brand with great after sales and customer services. So, if you are looking for a generator that is able to give stable yet smooth power in order to maintain the running of all of your appliances, then Honda EU2200I is the best choice for you.